Born at Windsor on 13 June 1824, Arthur Wagner was the son of Revd Henry Wagner (see following entry), the Vicar of Brighton, and it was his father who appointed him perpetual curate to St Paul’s Church in 1850. 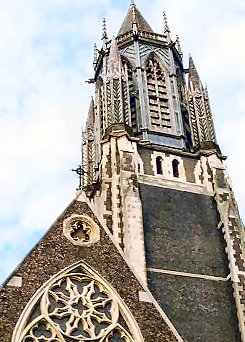 Arthur, who was greatly influenced by the High Church ideas of Dr Edward Pusey, established at St Paul’s a ritualistic ceremony which started the great public argument over ‘Anglo-Catholicism’ in the town during the mid to late nineteenth century. To assist with his parochial work Wagner also founded, at Queen Square, the Community of the Virgin Mary, a sect of Protestant nuns which was later connected with St Mary’s Home for Female Penitents. The controversy surrounding him reached a peak in 1864 when an inmate of the home, Constance Kent, stood trial for murder; Wagner refused to reveal in court what she had told him in the confession box. He was openly assaulted in the streets of Brighton, and was even shot at. Arthur Wagner lived with his father at the Vicarage in Temple Gardens but moved to the adjacent house, Belvedere, which was left to him by his aunt Mary, when his father died in 1870. He remained curate at St Paul’suntil his death on 14 January 1902 although he had been ill since about 1896. In addition to his ritualistic views Wagner is also remembered for his extraordinary generosity to the poor of the town. He had some 400 houses constructed in the Islingword Road district and the Round Hill Estate between the Lewes and Upper Lewes Roads, and also had five churches erected in the poorer parts of town mostly at his own expense, viz. : the Churches of the Annunciation; the magnificent St Bartholomew; St Martin; St Mary and St Mary Magdalene; and the Resurrection.